The Chinese New Year begins on February 5th this year. The Chinese New Year is the longest and most important holiday in China – lasting 15 days. It’s similar to Christmas .. as it’s a time of gift giving and feasting with family and friends. Traditionally is a time of house cleaning and saying good-bye to things that no longer serve our highest good and evolution. Prepare ‘special” holiday dishes for New Year’s Eve and New Year’s Day. Decorate the home with “live” flowering plants to symbolize growth and rebirth. Add candy & dried fruit to welcome in a “sweet” year. Set-off firecrackers, or top-off a bottle of champagne to welcome in the New Year. The Chinese believe that events that occur on New Year’s Day impact the rest of the year, so be MINDFUL of your words, actions and deeds. Wear NEW clothes, and the color RED for a bright future. Greet & bless relatives, neighbors, and friends. Gift money and poems to children and unmarried people for good luck. 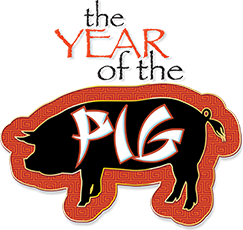 This year is THE YEAR OF THE EARTH PIG. If you haven’t already done so, it’s important to embrace “classical” Feng Shui this year. This is the only school of Feng Shui that changes annually. Both the lunar and solar systems affect us financially, emotionally, physically, socially and globally from year to year. Lo-Shu Flying Stars is a sophisticated school of Feng Shui that uses compass degrees & math calculations to determine the UNSEEN energy present inside homes, offices and buildings. Understanding the unique energy blueprint of your home, can help you IMPROVE the prospects for romance, love, marriage, conception of a baby, business, health, wealth, real estate, investments and security. On a larger scale – Feng Shui effects Cardinal and Bi-Cardinal directions of the globe. This year is a Powerful Year that will influence the earth, economics, politics, business, social and global change – DRAMATICALLY. This year you will want to take precaution. Like trying to ride the tail of a dragon, it’s better to be prepared than scared. I will share more with you in the coming weeks. In the meantime, how about adopting some Chinese customs and make January a month of MAJOR SPACE CLEANSING AND CLEARING – in your home and office? With Feng Shui, it’s always the best place to start..!